This one hour class offers both Floating and Infant Massage Instruction with time to feed your baby. Our Minnows classes provide a slower pace both for new moms and baby. Both Kristi & Samantha teach these classes and are ready to assist with your questions. You will benefit from the extra advice, tips and tricks that they will share with you to ease your transition into motherhood and out of the first 8 weeks. Knowing this can be an isolating, frustrating, confusing time, the class covers everything from the best apps, fastest way to burp a baby, helpful uses for breast milk, how to eliminate newborn gas, identify reflux, how much to feed your baby, how to get your baby to stop crying and more. This is a must have class for anyone wanting to learn more and socialize with other mommies in the same boat. We limit this class to 8 weeks of age for several reasons: 1) we like to keep all un-immunized friends together, 2) we like the mommies to share and support each other during this difficult phase, 3) after 8 weeks the babies are ready to move on to a more social environment with the older friends! Please book your baby in the appropriate age group, adjusted age for preemies. Parents, dress in layers, room kept at a warm temperature. Short sleeves recommended. This one hour class offers both Floating and Infant Massage Instruction with time to feed your baby. Our Whales classes are social and fun! Parents in this phase have emerged from what we like to refer to as “the gauntlet”, aka the first 8 weeks. Babies enjoy watching each other, mimicking movements and attempting to roll over. Prepare to laugh, share and learn more about useful products in these classes. Babies who have been coming regularly (i.e. weekly) are allowed to Float beyond 6 months if they still fit and they still enjoy it. Your instructor will let you know if you are getting close to graduating. We will not allow you to purchase a package if we feel that your baby will graduate within the upcoming 4 weeks. Please do not purchase a package at any time if you do not plan to come regularly. Single sessions are best used for uncertain schedules. Float Baby was founded in 2013 by Kristi Ison. Kristi is a married mother of two and a baby expert. She is a Certified Instructor of Infant Massage and she lives in Houston, Texas, with her husband and their two teenage children. 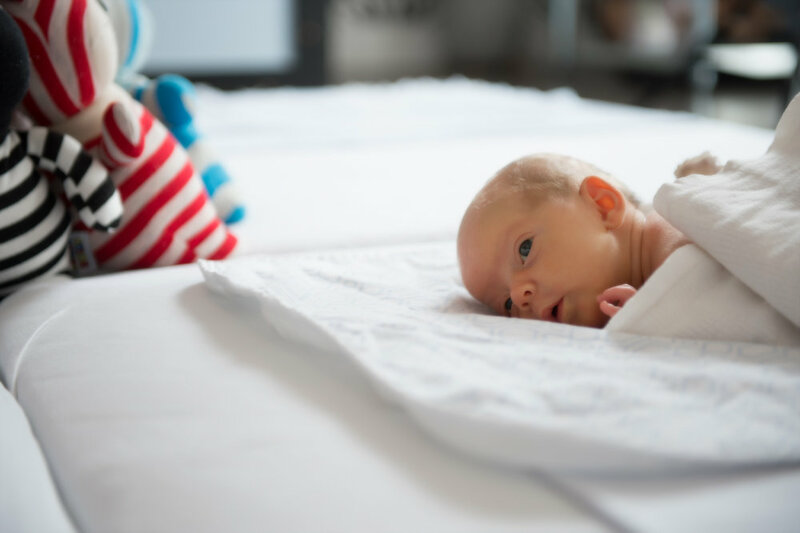 As an experienced mom, she knows just how overwhelming it is for a mommy struggling with her newborn’s sleep schedule, eating habits, and fussiness. Read more about Kristi below in our Staff section. Absolute, yet safest, cleanliness is our goal. We use only plant-based, chemical free cleansers in both our laundry system and store sanitizing. Every baby Floats in a private tub of fresh water, which is drained, sanitized and refilled prior to the next client's use. Twins float together. Our laundry purifying equipment uses the same technology previously available only to hospitals, hotels, and commercial laundromats. We are able to sanitize our laundry without any chemicals or additives that detergents leave behind. Bohemian Bamboo towels are used exclusively, as they are both anti-microbial and anti-bacterial naturally. Our monogrammed swim diapers snap down the side for quick removal and are made with a waterproof outer layer, super absorbent inner layer and wick-away lining next to baby's skin. See more facility images here. Our continuous air purification system actively produces hydro peroxides that sanitize and eliminate contaminants in the air. We ask that everyone utilize our automatic hand sanitizer after entering the facility. Our sanitizer contains 70% Isopropyl alcohol as its active ingredient and is the preferred solution for many clinical and medical applications. Scheduled on the third Monday of every month, Coffee and Answers offers a new speaker and topic from 10:30-11:30am. Float Baby & Formula 911 clients & babies under 6 months are welcome. If you are a Float Baby Client, you are welcome to invite a new friend free of charge. Float Baby was founded in 2013 by Kristi Ison. Kristi is a married mother of two and a baby expert. She is a Certified Instructor of Infant Massage and she lives in Houston, Texas, with her husband and their two teenage children. As an experienced mom, she knows just how overwhelming it is for a mommy struggling with her newborn’s sleep schedule, eating habits, and fussiness. 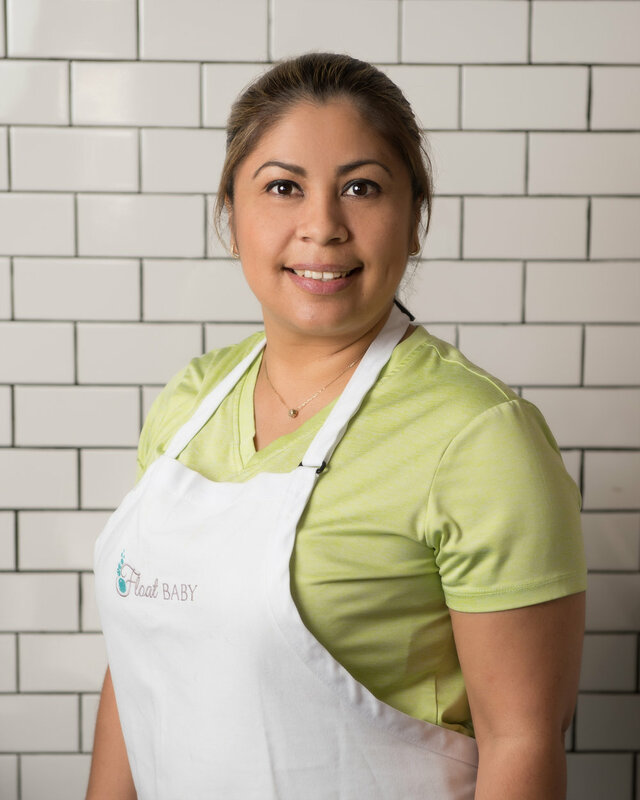 After an appearance on Shark Tank in 2016, Float Baby received overwhelming interest from parents seeking guidance on and relief from all things Newborn. She was inspired to develop and patent her own floatation device (The Hoverfish®), create an organic skin care line for baby’s most common issues, and finalize her franchise program. Kristi worked in the medical device industry for more than 18 years, specializing in unique technology and start up companies. With the launch of her most ambitious project yet, Kristi’s goal is to provide babies and their families with the many benefits that Float Baby can offer. Samantha Bible is a professional nanny with 10+ years of experience caring for children of all ages. She is infant and child CPR/First Aid certified, has extensive experience as a traveling nanny and working with special needs children. Our Float Babies love how Sam bounces them in the water! Teresa Ramos joined Float Baby in 2016. She has a degree in Business and Marketing that she earned in her country before moving to Houston. Teresa has two children of her own and loves babies. She is a tremendous help in keeping everything tidy and in tip top shape. Look for her during your class, or you may even meet her if she helps you with your formula purchase! We would be lost without our Saint Teresa!! Afton Baily Griffin, Founder and CEO of A Brand Strategy Consulting, is an experienced web marketing professional. She holds a degree in Corporate Communication from the University of Texas at Austin and is an American Academy of Project Management certified Master Project Planner. Katelyn Perkins is an experienced, independent social media and PR manager who helps brands strategize and execute their marketing plans. She has worked in-house in marketing departments for larger brands, as well as agency-side for PR firms.